Showing 1–10 of 1,583 items. 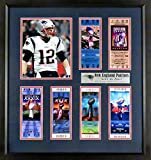 This very cool New England Patriots Super Bowl Tickets Display features an awesome 8x10 photograph of a fired up Tom Brady during Super Bowl LIII, his and the Pats sixth(!) Super Bowl Championship. SGA Exclusive "Let's Go Pats!" Plate, that also includes "6x Super Bowl Champions" and Patriots logo.